Snakes are common throughout the San Francisco Bay Area. Although most snakes are found in open spaces, often they will turn up in your own backyard. This is especially true as we continue to encroach into their territories. Most snakes are harmless and play a valuable role in our ecosystem. Snakes have a diet of rodents such as mice, rats, and other small mammals. Here in California the only venomous snake is the rattlesnake. 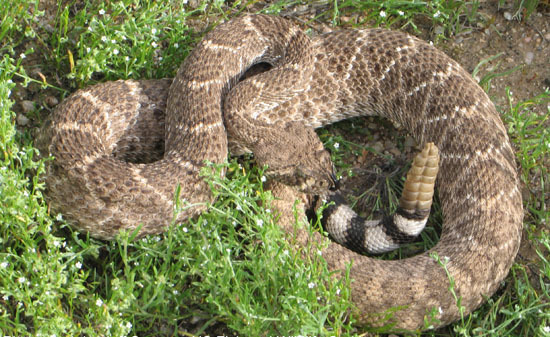 Rattlesnakes can give a warning if disturbed but this is not always the case. If a snake is found try to identify the snake from a distance, have someone keep an eye on the snake and then call a professional like Animal Capture Wildlife Control. Never attempt to handle any snake! If bitten seek immediate medical attention. Even harmless snakes can carry salmonella. Try to keep your property rodent free. This is accomplished by doing what’s needed to keep the rodents away in the first place, which in turn helps to keep away the snakes that prey on them. It’s a good idea to keep grassy areas such as lawns and fields low to the ground. Remove lumber and wood piles completely or at least off the ground. Metal racks to hold firewood are often used for this purpose and can be purchased at hardware stores. Trash piles or fruit left about the ground will also attract rodents. Bird feeders around the home are great for birdwatchers but when the seed falls to the ground it will not only attract mice and rats, but also skunks. Installing ¼ inch hardware cloth around the lower part of fencing will also help to deter snakes. Snakes can often move through holes and cracks to reach your under floor spaces. They can also gain entry through holes in the foundation vent screens. Once under, they often slither to the interior of your home through vents or up around pipes to come out in areas such as under your dishwasher and other locations. Sticky traps used to catch mice and rats can also be used on snakes. They can become stuck to these traps as they move over them. Snakes can be removed from these sticky traps by the use of mineral oil. We service Sacramento, Yolo, Solano, Contra Costa, Napa, Sonoma, Marin and other counties. As so many snakes reside in these areas we service, we will address the snakes we deal with most often. The Western Rattlesnake (Crotalus viridis) has many subspecies. Size and color can vary. Most are brownish in color and often have diamond looking or hexagonal markings that tend to narrow to bands at the tail. They mate in March or May and in August to October will have 4 to 21 young. Rattlesnakes can grow from 12 to 65 inches long with a broad triangular head that is larger than their neck. Rattlesnakes can give a warning rattle but sometimes will not do so. They can strike in 1/25 of a second! 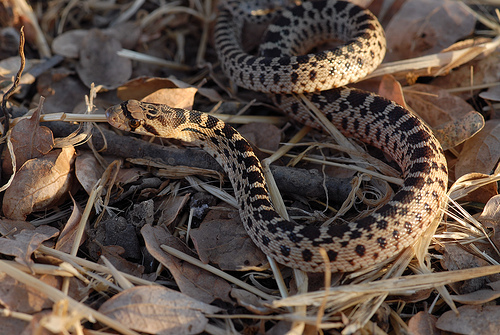 The Gopher Snake (Pituophis melanoleucus) has a number of subspecies. The gopher snake is large, strong and has a small head. It has light colors of black, brown and reddish markings. It is often mistaken for a rattlesnake. The tail has no rattle and ends in a point. It grows 48 to 100 inches long. It mates in spring and in approximately 64 to 79 days the eggs will hatch 3 to 24 young. 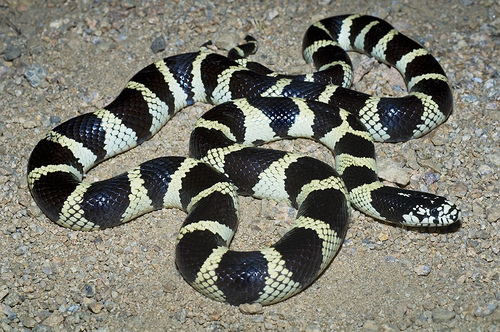 The California King Snake (Lampropeltis getulus) has black and white variable rings down the back and grows from 35 to 82 inches long. It mates in March through June and in May to August can have 2 to 24 young. This snake is a strong constrictor and eats not only rodents, lizards, birds and eggs, but other snakes and even rattlesnakes. We are highly qualified to take care of all your snake related issues. We are also available for weekly, monthly or yearly inspections of your property including under floor spaces. We are here to provide protection for you, your family and pets. We not only trap snakes but remove snakes in cities such as Tiburon, San Rafael, Novato, Sonoma, Napa, St. Helena, Alamo, Danville, Fairfield, Vacaville, Winters, Lake Berryessa, Davis and Sacramento. Appointments available 7 days a week!